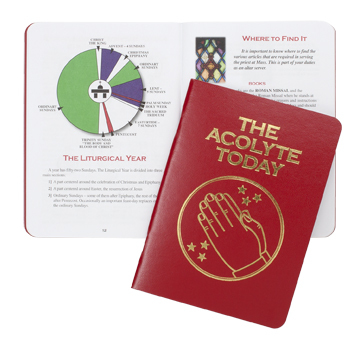 Includes more than 14 months, from the first Sunday of Advent through January of the following year, with one 9 1/2″ x 13″ page per month for 2019, full liturgical information for each day, plus generous space to write appointments or notes: pages for parish statistics and specified /unspecified Masses. 2019 edition available in October 2018. 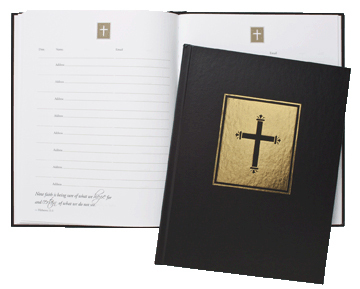 Easy-to-read display of complete liturgical information and daily readings on 6 1/2″ x 9 1/2″ pages. Listings given for Catholic, Protestant, Orthodox, Jewish, U.S., and Canadian holy days and holidays. Includes two-year calendar summary, through 2020. Available in January 2019.
prayers, saints, Christian Feastdays of fasting or abstinence, plus ample space for notes. Handy, durable pocket calendar, 3 3/4″ x 6 1/2″ with square-inch space for each day, plus month at a glance. 2020 Episcopal Edition available in May 2019. 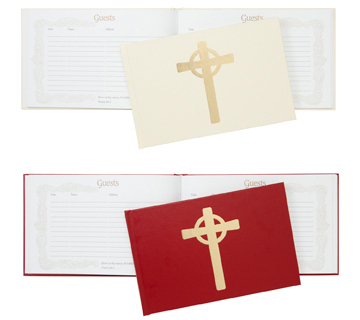 8 1/2″ x 11″ 2 color book, 95 pages 8 entries for guests names, email and addresses. Beautifully bound in sturdy black leatherette. Inspirational Psalms on each page. 124 page journal that is perfect for students on retreats, confirmation or those just taking notes. Acid free paper bound in sturdy leatherette that will last a lifetime. Easy to use and to carry with you in a backpack or briefcase.